Penthouse Floor/Corner Unit - Beautiful beach front condo! You will be dazzled by the beautiful views from our Condo. The Condo is a corner unit located on the 26th floor, a Penthouse Floor. Staying on this floor allows you to enjoy Panoramic Beach, Coastline and Gulf views. Our ceilings are 10ft high and we have two 9 1/2 ft Infinity windows (Floor to Ceiling Windows) in the Living Room along with a 9 1/2 ft sliding door that opens out onto the balcony. The balcony faces directly onto the beach. The view from our balcony includes the Beach, Gulf, Coastline and Pier Park. It's so nice to have the choice of either sitting on the balcony to enjoy the views of the ocean and coastline or be able to sit on the sofa in air conditioning (out of the heat and humidity) to enjoy the views of the ocean, coastline and Pier Park. 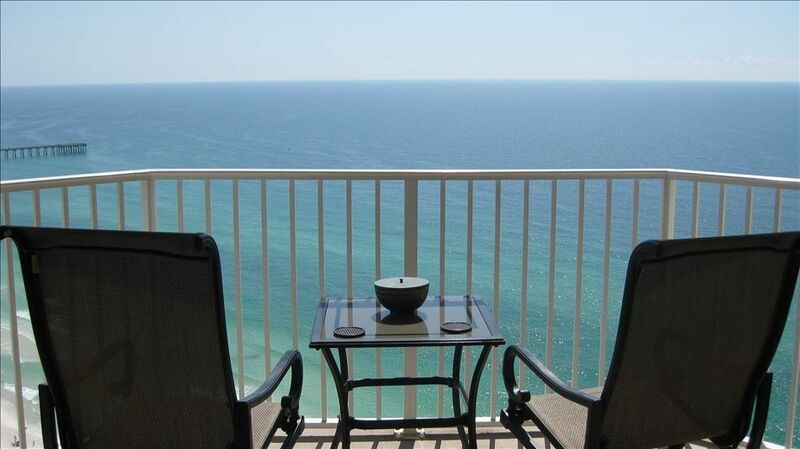 Our 110 sq ft balcony faces the Gulf of Mexico and is perfect for enjoying your morning cup of coffee while reading the newspaper or your newest paperback novel. Bring your binoculars for watching the early morning Dolphins and various schools of bait fish. Sting Ray watching is best in the early afternoon. The Gulf of Mexico water is Aqua blue and the beaches are a fine white sand, Panama City beaches are rated one of the most beautiful beaches in the world. We offer a luxurious interior designed condo. Flat screen T.V. 's with built in DVD(s)in both the living room and master bedroom, Travertine tile floors, Granite Counter tops and in unit Washer/Dryer along with complimentary Wi-Fi. Panama City Beach, FL, 'The Beach Lovers Beach,' is best known for its sugar-white sand beaches and clear, emerald waters of the Gulf of Mexico and St. Andrews Bay. The soft Panama City Beach sand is actually quartz crystals, which over time has been broken down, bleached, polished and deposited on the shoreline. This natural process has made Panama City Beach home to the 'World's Most Beautiful Beaches.' Located in the Northwest portion of the state, Panama City Beach boasts over 27 miles of award-winning beaches and has been recognized by the Travel Channel, Southern Living Magazine and Dr. Beach as a top US beach destination. Overlooking the Gulf of Mexico, Panama City Beach is located in the Northwest region of Florida. Panama City Beach averages an elevation of 13 feet above sea level. Located 98 miles southwest of Tallahassee, Panama City Beach is a part of Bay County. Bay County boasts an average population of 150,000. Approximately 9,500 of these citizens reside in Panama City Beach. This is the perfect spot for a beach vacation in Florida. Close enough from just about anywhere in the Southeast, but far enough away that you know you're in a different vacation spot. Average water temperatures of 72 degrees combined with an average air temperature of 78 degrees creates mild subtropical temperatures for year-round enjoyment. As of 2017 estimates, the population of the City of Panama City Beach was 13,453. Unincorporated was approximately 35,000. Bay County is an area rich in American history. The St. Andrew Bay area was home to many Indians before it was settled as a community in the 1800s. Pirates found the deep pockets of the Bay ideal to 'lie in wait' for richly laden ships in route to Mexico or Spain. Legend has it that many a pirate buried his share of treasure at Spanish Shanty Point on Shell Island. Another area teeming with history in Panama City Beach is St Andrews State Recreation Area. During World War II, it was part of the St. Andrews Sound Military Reservation. Circular cannon platforms are still in place near the jetties. Opened in 1951, the park now covers more than 1,200 acres. St Andrews State Recreation Area is one of the most popular outdoor recreation spots in Florida. Rated the 'Number One Beach in America' in 1995 by coastal authority Dr. Stephen Leatherman, it is best known for its 1.5 miles of white sand beaches, natural dunes and crystal-clear water. Make sure you make your way to Pier Park. This has all the shopping you'll find in any major city. CHICO's, Abercrbombie, Hollister, you name it. Plus, you'll find Dillards, JC Penney & Target. Come Relax and Unwind at the Beach! My husband and I are professionals who love to get away to the Beach whenever we can. Until we can retire here we want to share our home with others like you. We've traveled and stayed in other parts of Florida, while each of them had they're own unique quality, PCB won hands down as far as Ocean, Beaches and Entertainment. We wanted to be West of Pier Park but still be within walking distance by street or beach. Tidewater offers numerous amenities suited for kids, adults basically the entire family. We love natural light and our condo offers exactly that. We have very few pictures hanging on our walls due to the windows and the ever changing views that serve as our landscape pictures. It's a condo like very few in PCB. We hope you come stay with us and experience it. Local phone service is available at our condo, please note not all condos in Tidewater have telephone service. This condo is on a Penthouse floor and a Corner/End unit, two infinity (Floor to Ceiling) windows allow you to view the beach and coastline, windows in both the Kitchen and Bedroom allow views of Lullwater Bay and surrounding areas of PCB, the Balcony faces directly to the Gulf of Mexico. Other Amenities; 2-outdoor pools, 1- indoor pool, Game Room, Movie/Media Center, and just minutes from Pier Park. We loved the condo. Great view . The owner was very easy to work with. Everything was smooth. Directions and how to get to everything and registered were easy. Easy access with parking garage. BEAUTIFUL view. The wait on the elevators was a bit annoying, probably wouldn't be as bad when they aren't in the busy season. We went the 2nd week of June. Upon arrival the room was dirty and didn't seemed to have been vacuumed. Two days into the stay we noticed quite a few small bugs in the kitchen area. Other then that the view was great and the weather was amazing. We really enjoyed the lovely Condo. The view was fabulous and the condo was nicely decorated. I loved that it had a washer/dryer. That made it so convenient. I have no issues with this lovely home but our trip was kind of a let down. I was really ready to just relax but there were several different obstacles that made it a bit stressful. The elevators are such an issue. You have to wait so long for it to come up then to go back to your room it's another long wait. Sometimes they are full so after waiting a long time you can't get on and have to wait again. I realize there is about 350 condos in this building so it is what it is. The beach is extremely crowded. And the biggest letdown was all the horrible thick soupy green algae in the ocean. It was right at waters edge and smelled awful. You could not swim in it. There was a clear section quite a way down the beach so we walked down there. Along the way I saw quite a few dead fish washed up on the beach and dead ones in the water at the waters edge. We spent all of our water time at the pool. The pool was very nice. Crystal clear and big. But I didn't need to drive 13 hours to swim in a pool. Panama city Beach is a little too busy for my taste. In the past we have gone to Madeira beach and you just go down a few floors and walk about 25 steps and you are at the beach. And it has less than half the people that were at this beach. Dinner was not a major chore to go to and no 2 to 3 hour waits to get a table. We were with my daughters family and that is impossible to do with a 2 year old. Unfortunately I won't be coming back to Panama city Beach. It's just not my style. For others that don't mind the crowds it is a fine place. But the water has got to clear up first. But none of this is a bad review for the condo. The condo is great. If I could just put it on another beach it would be perfect. Thank you for allowing us to stay in your home. Despite all of the not so good things we did have a nice time. I loved shopping at pier park and eating at wicked wheel. We had a delicious home style breakfast at Jeanie s diner. Very affordable and great quality. Wish I would have found it sooner than the day we were leaving. Their menu board had so many things for lunch I would have loved to try. I highly recommend eating there. Great getaway for me and my family! The owner was very prompt with response to any question I had. Beautiful condo, just the right size for us. The view from the balcony was perfect. We definitely could have stayed longer if our jobs had allowed! Thanks again for everything!